With powerful graphics—the top sellers are the 8 ball, that original watermelon, a 1950s-inspired Formica tabletop look and a checkerboard pattern—Nutcase has altered the landscape in helmet design forever. Michael Morrow likens himself to Willy Wonka, sans the chocolate and with helmets galore, of course. But the only thing crazy about Nutcase helmets are the graphics, which consist of a vast array of fun designs. Morrow, though, didn’t start Nutcase based on his love of helmets. It was, in reality, a somewhat opposite experience that gave him his start. “How come all the helmets are kinda lame in a way, graphics wise,” he asked in 2000 when trying to develop a fan-friendly helmet for a Civil War game (that’s the Oregon vs. Oregon State football game for the uneducated, in Pacific Northwest speak). “Not very many [helmets] inspire you to want to wear them. They were really not very good. Barney dinosaurs and bad skull and crossbones or a bicycle helmet itself that is not that attractive." “I thought maybe there's something here, maybe we could make helmets more cool, more fun, more interesting to wear," says Morrow. "People don’t like helmets because they don’t like the way they look.” But if people like the look, they’ll wear the look, and that interest in design will in turn breed safety. And while he created other people’s brands, he was always working a little on his own. 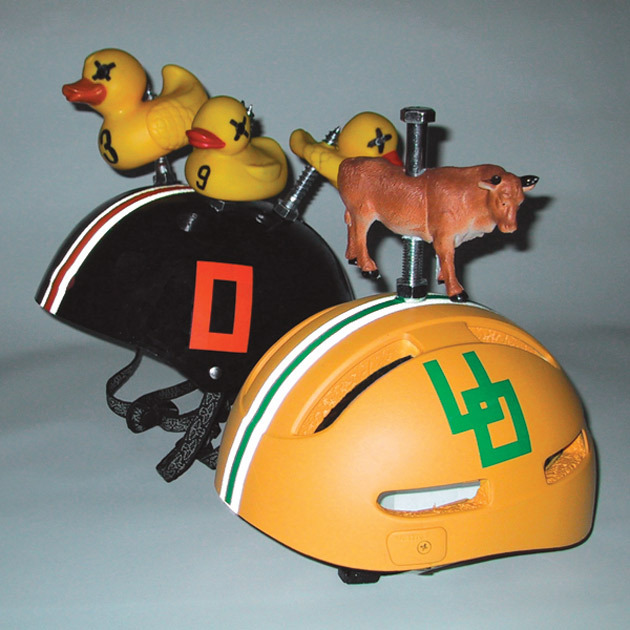 Morrow launched his own creative brand agency in 2000, the same time he toyed with making a fun helmet to support one of his clients, Oregon State University (pictured). As a brand strategist, Morrow knew he needed a catchy name to connect to consumers—he says the Portland, Oregon-based company even sells solid colored helmets because people like the fit and the fun aspect of the name. With a name that ties to Michael and his wife, Miriam, having a bit of Willy Wonka in their personalities and the obvious play on your head as a nut, Michael brought his first helmet to the market in 2006, a watermelon design on a brain bucket-style that Nutcase uses because it simply looks better on folks, appeals to youth and makes for a better surface to build graphics onto. The skate-style helmet isn’t just for the board, though. Nutcase has the same style—with a removable visor, mind you—for bicyclists, skaters, water sports, snow sports and Moto X. What started in 2006 had grown to the point in 2010 that the creative brand side of Morrow's business stopped taking new clients so Nutcase could keep moving forward. With powerful graphics—the top sellers are the 8 ball, that original watermelon, a 1950s-inspired Formica tabletop look and a checkerboard pattern—Michael has about 50 looks out in the market at one time. But with 120 designs in the past eight years and 25 fresh looks for spring 2015 getting their finishing touches right now, there’s plenty to chose from. The helmet itself has grown right along with the Nutcase designs. Michael kicked off the company with a mold from a helmet factory, but the new spring 2014 line, their generation three helmets are the first with a Nutcase-specific mold, allowing them to play with technology. Nutcase helmets now have more interior ventilation and a crumple zone in the EPS foam that circulates energy around the head instead of through it during impact, all resulting in improved impact test scores. Nutcase also upgraded the fit and made the adjustable spin dial a removable feature. And that super-nifty magnetic chin strap buckle? Yeah, that brilliant pinch-free move was created by a German company and Nutcase was the first to bring it to the market, a wacky move that falls in line with the nutty graphics.